I’ll admit that being a huge fan of the Daleks, I was pretty hyped up for this episode, especially after seeing the bits and bobs in the trailer. With a fairly good writer on board, and a novel idea in the can, I was pretty hyped up for “Victory of the Daleks”, sadly due to this over-anticipation I may have caused myself to be a bit underwhelmed by the end of the whole thing. Note: I try to keep these as spoiler free as possible to avoid ruining the episodes for folks. At the end of The Beast Below we were treated to a plot device that has not been seen for a while in Doctor Who: a scene that leads directly into the next episode. 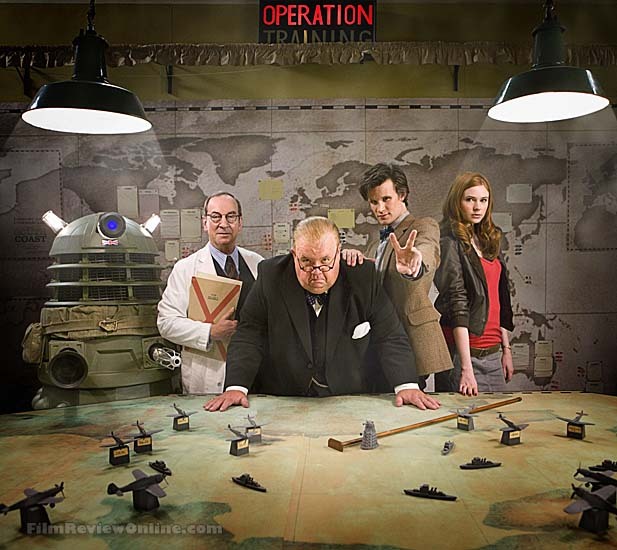 The scene in question showed a certain Winston Churchill calling the Doctor begging for help, as we see the evil shadow of an old foe about to exterminate Churchill. As we begin Victory of the Daleks something has changed, Churchill is smug, and seems to think he has the war “in the bag”, all due to a “secret weapon”. Victory of the Daleks has some bright spots and some rough edges sadly. First things first, the acting is superb especially with Ian McNeice as Winston Churchill. Rather than try to emulate Churchill 100%, McNeice grabbed the raw essence of what Churchill was about and ran with it. In the accompanying episode of Doctor Who Confidential, he basically said he wanted to emulate the tone and demeanor of his speeches, which I think worked well. Matt Smith and Karen Gillan were also very good, but Smith really shined in this episode. His wild “these are the Daleks, and they are evil” rants were spot on, and made the Doctor look about as crazy and hateful, as those he was condemning. The rough edges I spoke of seem to be either due to the editing process or unfinished thoughts in the writing itself. There are more than a few extraneous subplots going on like a girl that works for Churchill who is worried about her boyfriend, a pilot for the Royal Air Force. We occasionally see her lamenting on his possible death, and other things that add absolutely nothing to the plot whatsoever. It almost seems as if this was originally going to be a “two-parter”, and all the padding got removed. Sometimes Doctor Who adds back stories for side characters and such, but as this character doesn’t really actually speak to the main cast, or reveal her name as far as I can rmemeber, she was pretty much wasted space. 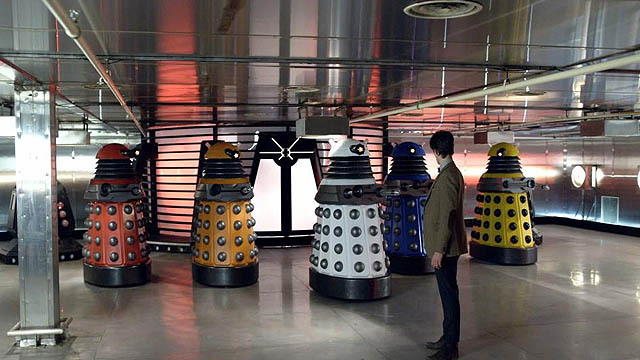 The re-design of the leadership Daleks was cool, and brings a bit of scariness back to the characters. The old Daleks were modeled after actress Billie Piper’s eyeline, and these are in line with Matt Smith, who is about 70 feet tall. Because of this added height and deeper voice, these Daleks look to be quite menacing in the future. 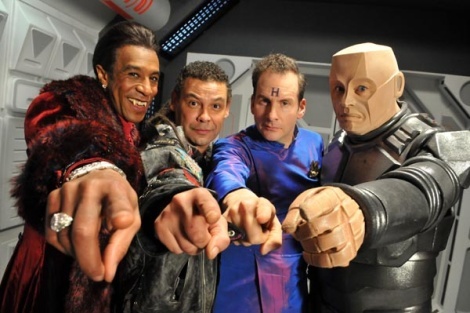 Sadly they don’t do too much in this episode aside from taunt the Doctor, which is a shame. The Daleks do end up with a VERY bright new paint scheme that reminds me of the colors for Star Trek rankings. Then again I was also wondering if the Daleks were going to form Voltron at some point, so I can see why folks might not like the new direction. I’ll admit that being a huge fan of the Daleks, I was pretty hyped up for this episode, especially after seeing the bits and bobs in the trailer. With a fairly good writer on board, and a novel idea in the can, I was pretty hyped up for “Victory of the Daleks”, sadly due to this over-anticipation I may have caused myself to be a bit underwhelmed by the end of the whole thing. Not to say that this was a bad episode, but it was just average in my book, although it served a great purpose in rectifying all the shenanigans from the last few seasons, and will hopefully keep the Daleks alive for a while still. I was perusing Netflix’s streaming tab one day, and noticed a few new shows added to my “you might like this” tab. 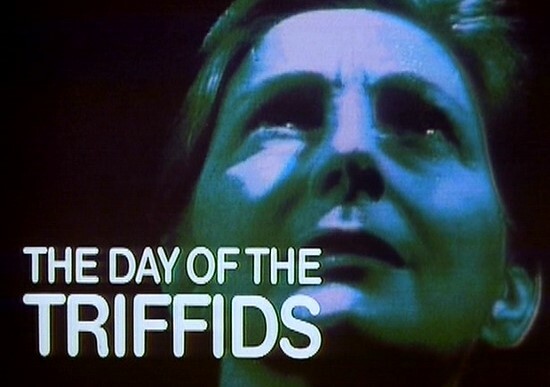 One show in question was one that I had heard of, but had never seen called “The Day of the Triffids”. Since then I have researched it a bit more, and discovered that a 2009 remake was made, and a few theatrical movies exist of the story, all of which was originally a book by John Wyndham. I hope Netflix keeps this up, as I’d love to see some more stuff that I can review for this site. As the episode opens, we see a man named Bill Mason, who is laying in a hospital bed with bandages covering the majority of his face. We learn, through various flashbacks, that Triffids were some sort of plant, whose oil could be used as a new source of energy. It appears that some sort of energy crisis is afoot, and the new Triffid oil is the best around. The problem is that apparently Triffids seem to be either sentient, or at least move around to feed, as Bill knows the best of all. He was the first to officially be “attacked” by a Triffid as a child, as one was able to sting him pretty badly. He gained expertise in the subject, and later went to work on a Triffid farm of all places. His injury, that as of yet was a mystery, seems to come from another Triffid sting, that left him temporarily blind. As Bill lay in bed, the world bears witness to a beautiful meteor shower, one that will change mankind forever. The story in itself is a breath of fresh air for a person like me, who has seen just about any science fiction plotline used umpteen times. To be honest, I really can’t say that I’ve seen a show about walking killer plants. The budget for The Day of the Triffids is obviously pretty small, but doesn’t seem to suffer from the budget shortcomings of shows like Doctor Who and Blakes 7, probably having to do with the short duration of the miniseries. 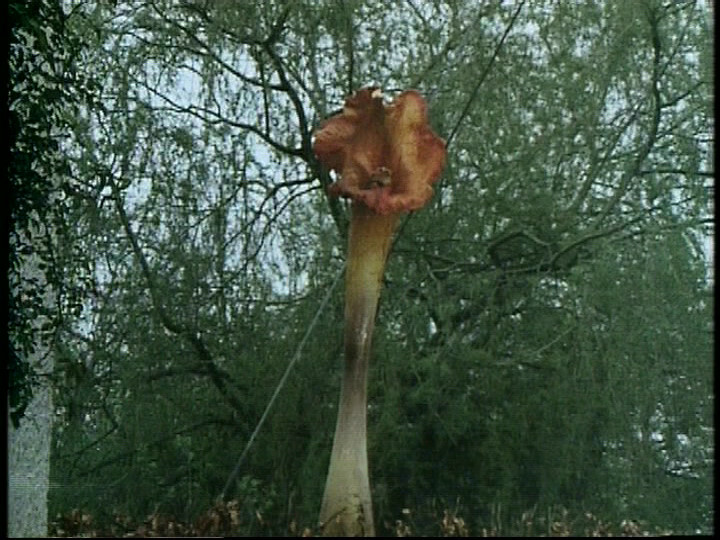 The special effects are pretty good, but sparse, and the only real heavy amount of them you see are the Triffids themselves, which look like a huge Amazonian carnivorous pitcher plant, mixed with some kind of houseplant. I will definitely keep watching this show, and now plan to check out the other versions of this story, as I love post-apocalyptic stories, which I assume is where this goes, and weird stuff in general. 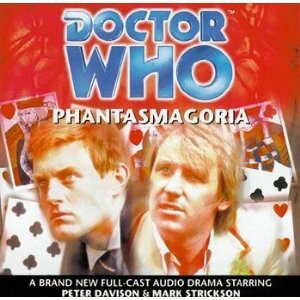 With the medium of audio plays, it was a matter of time before Big Finish explored some kind of sound based monster for their Doctor Who audio dramas; I’m just surprised that they did it so soon. 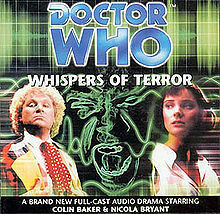 Whispers of Terror marks the third monthly Big Finish Audio, and the first to star Colin Baker (by himself) as the Doctor and Peri as his companion. The story follows the Doctor and Peri as they end up snooping around a museum called the Museum of Aural Antiquities, where every sound is tucked away in large storage devices. Almost immediately we find out that a murderer is afoot, and someone is changing old political speeches for someone’s gain. If all that sounded bad, there also seems to be some kind of monster made of pure sound running around. Colin Baker and Nicola Bryant almost immediately recapture their on-screen chemistry, and work well to make this seem like a “missing” Doctor Who episode. Peri has always been a double edged sword for me, as Nicola Bryant was always nice to look at, but lacked a convincing American accent. I know this may not be a real problem for those in the UK, that don’t have the ear for American speech patterns, but Peri was usually very far off. In Whispers of Terror, Peri is in top form, as Nicola has obviously matured as an actress, and the role is acted shockingly well for me. I feel that this revelation has really helped me gain a new found appreciation for this Doctor/companion pairing, that I really didn’t have before. All in all, Whispers of Terror is a solid Doctor Who audio, if not a little on the average side. So far I have noticed these dramas getting progressively better, and this is not exception. Following on from the innovative and era-defining hits Spooks, Hustle and Life On Mars, Kudos Film & TV is moving into another new world. BBC One has commissioned a new eight-part drama series, Outcasts. Sounds a bit like Survivors, but I’ll definitely try to check it out. Sarah Jane Smith is reunited with another of The Doctors former companions, Jo Grant (Katy Manning), plus the eleventh Doctor (Matt Smith), in the new series of The Sarah Jane Adventures this autumn. Katy Manning, who recently returned to live in the UK, says Playing Jo Grant again is something I never really considered. I was gob-smacked when they told me and I am over the moon. What an incredible little treat. I come home and this is one of the first things that happens. The team will be taken inside a secret base beneath Snowdon and meet a brand-new vulture aliens, the mysterious Shansheeths, plus a trip to an alien planet – a first for The Sarah Jane Adventures! A2A season 2 coming stateside! After the bait and switch that occurred last year, where season 2 was announced to show up at the same time as the UK then canceled with no word from the company, this is welcome news to me. The Beast Below welcomes The Doctor, Amy, and the audience to Starship UK, a huge chunk of flying rock that may or may not be the literal landmass of Britain, Wales, and Northern Ireland. The Beast Below welcomes The Doctor, Amy, and the audience to Starship UK, a huge chunk of flying rock that may or may not be the literal landmass of Britain, Wales, and Northern Ireland. Scotland of course wanted its own spaceship, and did not join the others on their trip. We find out that Earth was under attack by solar flares, so everyone took to the skies. Right from the get-go we find out that nothing is as it seems: there seems to be no power running Starship UK, and there are ominous fortune telling statues called “Smilers” watching over the population like some sort of steampunk “big brother”. As a second episode, The Beast Below does everything it should do by playing up the relationship between the Doctor and Amy. We see playfulness as the Doctor “shows off” a bit by dangling Amy outside of the Tardis, and anger as the Doctor nearly decides that Amy’s trip is over towards the end of the episode. 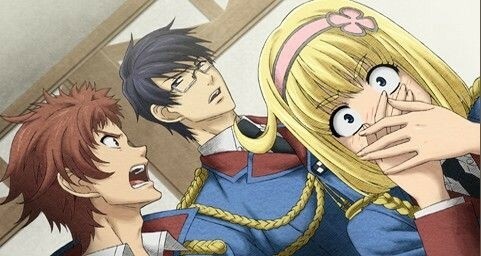 Because of these extremes, this episode is quite emotional, but it seems realistic. Sometimes older episodes had an “emo” or over the top feeling to them, which rubbed me the wrong way. The cornerstone of this emotion is Matt Smith who shows he is a great actor and amazing choice for the role. When confronted with a horrible choice, we see the Doctor lashing out at those around him, which is terrifying and jarring, but not in a bad way. The Doctor is given a moral dilemma where he basically has to choose between killing and killing, and this does not make him happy. On the technical side of things, this episode seems a bit less polished than the last. I wasn’t sure if it was the direction being a bit less well realized as The Eleventh Hour, but I feel that it was a major part of it. 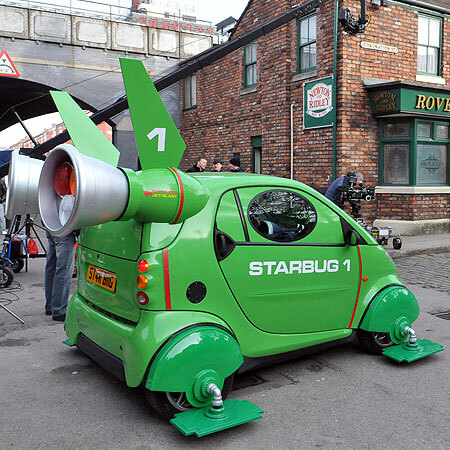 This is by no means a bad thing, as I still loved the way it was done. There was a bit of explanation missing however that made me feel as if a missed opportunity had occurred. 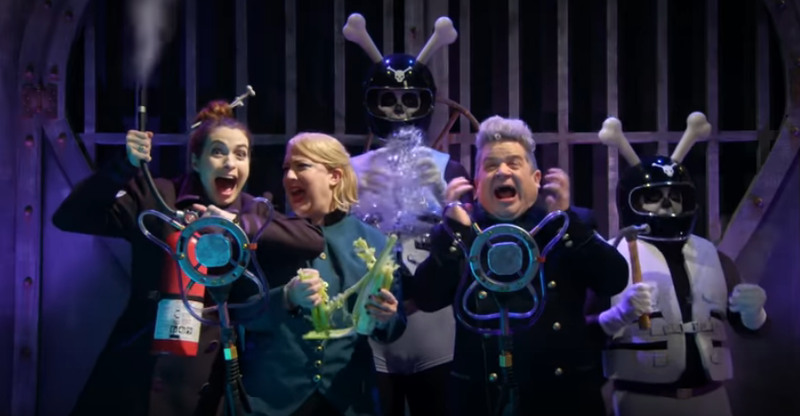 The episode has two sets of related villains called Smilers and Winders. Smilers are the clockwork fortune telling machine dummies that watch over school children to show whether they are doing good or bad, and Winders are a group of robed men that seem to be sent out by the Smilers when someone is naughty. I am making assumptions here as it is never truly explained what the Smilers were originally used for, only that they are creepy and show a person if they are doing the right thing. The secondary cast was pretty good, although a bit one-dimensional in parts which made me think of old sci-fi characters from shows like Buck Rogers. Liz Ten is a prime example of this as she is not too far removed from a silly Flash Gordon style Space Heroine. Much like my small criticism of the direction in the episode, this is not by any means a deal breaker, and the supporting cast is still leagues better than most characters I’ve seen in many shows. I think my main problem lies in that Moffat generally writes fairly memorable side-characters in his scripts, these did not match up. The “voting booths” are quite topical considering the UK is about to finish up an election. All in all, I loved The Beast Below and found it to be a nice space opera style romp, with a lot of hard-lined emotion. We get a chance to see the doctor at his wacky best, but find out that this Doctor is not all fun and games at all times. The Eleventh Hour wasn’t just a good episode; it was a great episode, and possibly one of the best first episodes for a doctor ever. In the year leading up to this “re-launch” of Doctor Who, many fans were acting in polar opposites. On one hand, we had a cult beginning to form around Steven Moffat, the new show runner and head honcho of production. Fans of his previous work in the series including The Girl in the Fireplace, Blink and many other episodes began to see him as some sort of savior- a man who could do no wrong. Others were being alarmist calling for Moffat’s head after initial casting announcements and the departure of David Tennant. Now that The Eleventh Hour has aired, is the show in good hands? In short, the answer is a resounding yes! A new Doctor, a new Tardis. Immediately, one can tell that this is not the same vision that former Executive Producer Russell T Davies had for the show. Much like his previous episodes, Moffat takes care in making his characters and locations seem straight out of some sort of dark fairytale. In short, the story of this episode is nothing spectacular, but does a wonderful job of establishing a new Doctor, a new companion, and a new style to the show. Amelia trying to satisfy the Doctor’s food cravings. The Doctor messes up and disappears for 12 years after promising to be right back, only to meet his young friend again as an adult. Amy now questions whether the Doctor even existed, and was sent to therapy because of her encounter with him. The theme of this episode seems to be trust, as Amy isn’t sure if she can trust the Doctor. What follows is a wild romp to stop Earth’s destruction at the hands of the Atraxi, a race of giant eyeball creatures who are looking for an escaped monster called Prisoner Zero. is made horrifying with Prisoner Zero. Matt smith breathes new life into the Doctor’s character that I feel was much needed. Not to knock David Tennant, as he still is one of my favorite incarnations of the Doctor, but I felt that his portrayal started to feel tired towards the end of the 2009 TV specials. Many have pointed out that Matt Smith has supposedly based his take on everyone’s favorite Timelord on that of the late Patrick Troughton who played the Doctor in his second incarnation. I can see this to a degree, but can see many mannerisms from a multitude of actors that have played the role. That’s not to say that Smith’s portrayal is simply a pastiche of previous actors roles, but he obviously wants to pay homage to those who came before. Smith also brings a lot to the character with the way he talks, his odd appearance, his almost arrogant demenor, and his eccentricities (i.e. licking a shed to date the wood). Some were worried having an actor so young playing the Doctor, but all of that was put to rest for me as we see him step out from a projection of David Tennant’s face late in the episode; we see that he simply IS the Doctor. Next up is the sultry adult Amelia Pond, or Amy as she is calling herself these days, as played by Karen Gillan. Karen portrays Amy as a confident strong female character. Gone are the days of the female companion that only yells “oh Doctor”, twists her ankle, and gets captured in every episode of the classic series, but Amy even seems different from the modern “unrequited love for the Doctor” companions. When we first see Amy, she even knocks the Doctor silly with a cricket bat, thus proving that she may be the toughest or at least the strongest willed companion in a while. Even though Amy is seen to fancy the Doctor a bit, she is by no means smitten with him. I think this comes into play for two reasons: she’s engaged, and she sees the Doctor as her “imaginary friend” as she saw him as a child. The supporting cast, such as Rory here, were great as well. I feel that Moffat wrote her introduction perfectly, as we don’t have to deal with another “prospective companion has to prove themselves” storyline, as Amelia already did that as a child. I always dislike when the Doctor is made to not trust his companion, and a situation like Martha Jones was not what I wanted to see. For those who do not remember, Martha was basically only taken onboard the Tardis so that the Doctor could try to forget about Rose, but was left in the cold about 99% of the time. The Doctor treated her sort of badly, and didn’t even make her a true companion until half-way through the show. No wonder the character decided not to stick around. 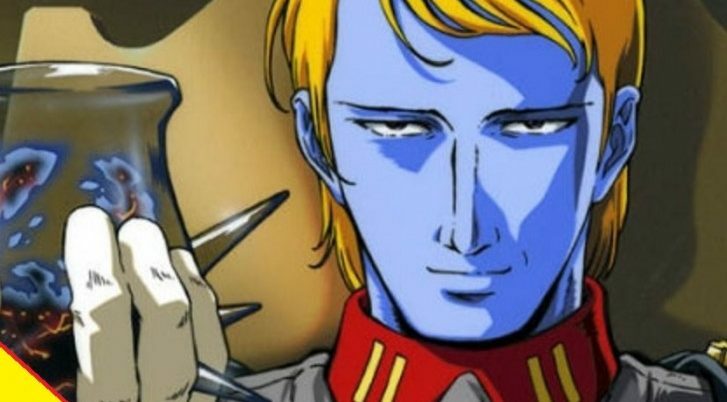 The only real bad thing I can say about the episode is that the Atraxi and Prisoner Zero were not that compelling as villains, but that seems to be the point. By concentrating on the building relationship between Amy and the Doctor the episode prepares us for the whole season and the new production style 100% as the story ends. The Eleventh Hour wasn’t just a good episode; it was a great episode, and possibly one of the best first episodes for a Doctor ever. Rather than have the Doctor lay around sick all episode or try to kill his companions, we are given a Doctor forced to take on an alien takeover with only his mind, a biff difference from what usually happens. Through the strong performances by Smith, Gillan, and the supporting cast, I can see that this season will be truly great. I now leave you with a clip of the new theme as well as a trailer for the season, and yes I loved the new theme!